Cal's 2018 recruiting class didn't make big waves in the recruiting class ratings, finishing a pedestrian 42nd on 247 and 44th on Rivals. But as is so often the case, the ratings don't tell the whole story -especially at first glance. In most years, roughly half of a recruiting class will see meaningful snaps or make much of an impression during their first fall camp. In fact, there are many occasions where less than half a recruiting class does anything of note or even sees the field for more than a handful of plays for their whole collegiate careeer -even in highly-rated classes. In Cal's first class under Jeff Tedford in 2002, only six players of the class of 18 did anything at all for the Bears. In Cal's 14th-ranked class the next season, their hit rate was only 50% of their class of 28 that played any role on the field in their Cal careers. Scouring each of the Bears' recruiting classes over the past decade and a half will not reveal one class with more than 50% of an individual class contributing on the field in any measure of note in their Cal careers. Perhaps the starkest example is the 11th-rated class of 2010, which had only a paltry seven contributors during their Cal career in the whole class. Recruiting is an inexact science. Sometimes fit, sometimes passion for the game, sometimes health all play a role in a prep's future collegiate career. 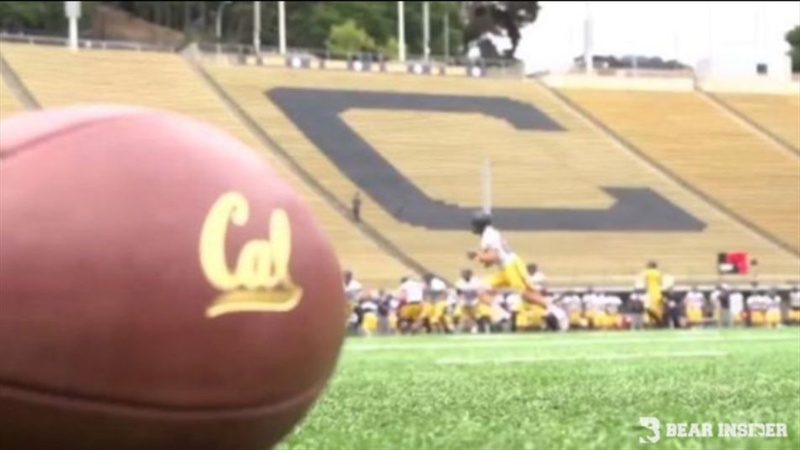 And at a unique place like Cal, with challenging academics playing a large part of the equation, a premium is placed in strong recruiting evaluation correlating to future success on the gridiron for the Cal program. A positive out of the gate was that every member of Cal's 22 man class, save linebacker Chris Fatilua, who suffered a likely career-ending injury from an accident over the summer, arrived on campus at Cal healthy and ready to practice. The Bears had a 2-man class at running back, bolstered by the addition of a third back in preferred walk-on Laney College (Oakland, CA) transfer Marcel Dancy. The trio made big waves right off the bat at Memorial. A running back corps that was paper thin suddenly had seven backs capable of working into the rotation. 6-2/220 Oceanside running back Chris Brown came off a senior season where he was slowed by an ankle injury. He was a new man in camp, with a lethal combination of burst and power. Before falling to a lower body injury days ago, 5-10/195 fellow frosh Johnny Adams showed good speed and wiggle, with an ability to generate nice gains. And junior Marcel Dancy might've been the biggest revelation of all, shooting up to #2 on the depth chart with quickness, vision, toughness and hands out of the backfield. Heading into the offseason, the Bears only had room for two receivers and until late in the recruiting season, it looked like there was room for only one. The Bears struck their claim early on 5-10/170 4 star Mater Dei (Santa Ana, CA) receiver Nikko Remigio, who formed 25% of one of the best wide receiver quartets in prep high school history. Remigio has been money all camp, making tough catches over the middle, proving tough to get a hit on and showing strong potential in the return game on special teams. The Bears made a late add in 6-0/190 New Mexico receiver Monroe Young, who showed flashes early in camp before being temporarily sidelined by injury. With the numbers at WR this season, Young is likely to redshirt this year. Add in 6-3/220 Michigan grad transfer Moe Ways, who's essentially part of the class, and you have a big-bodied, strong blocking, dynamic receiver from the looks of things in camp. Tight end was maybe the thinnest position on the Cal roster last season. A couple new arrivals and the return of Ray Hudson for a 6th season have remedied that problem in a hurry. The arrival of super-athletic 6-5/235 South Lake Tahoe tight end McCallan Castles gives the Bears a legit red zone threat who can go where most DB's can't to high point balls as well as a future mismatch up the middle down the line. Add another wild card in the other Michigan grad transfer, 6-7/255 senior Ian Bunting, who's been a load and a half for the defense to contain, as well as a powerful blocker. The Bears brought in a big haul on the O-line, taking five prep players. The group is led by 6-5/270 4 star Granite Bay OT Will Craig. Craig has made rapid progress in camp and has taken the lion's share of 2nd team OT reps through camp and will almost certainly be in the rotation this season. 6-6/285 former Clayton Valley OT Brandon Mello has also impressed and could well be in the rotation sooner than later this season, as well. 6-4/270 former Skyline (Sammamish, WA) OG Matt Cindrich has been the third in a trio of impressive freshman linemen. A week into camp, Cindrich began taking reps at center for the first time in his career and has responded well. He seems to have a bright future at Cal. Massive 6'7 OT's Jasper Friis and Miles Owens appear to be more developmental players that will have a chance to contribute down the line. The Bears brought in two on the D-Line and both new players can play either inside or outside and have both done a little of both during camp. After the decommitment of Serra NT Atonio Mafi to UCLA, the Bears bounced back well with the flip of former 6-3/295 Bruin commit Aaron Maldonado from Bishop Amat in La Puente, CA. Maldonado has been a constant active presence on the Bear DL all camp and will play early for certain. Mt. SAC junior transfer Lone Toailoa has also shown well, particularly with push up the middle on pass rush. The 6-2/280 New Zealand native is still learning the game but should give the Bears some good depth and minutes this season with his tremendous work ethic. The Bears picked up a sextet of LB's in the 2018 class, beginning with midyear transfer Colt Doughty. The 6-3/235 CSM transfer will be called upon for depth at the thin ILB position and has benefitted from participating in spring ball. Also from the JC ranks at CSM is 6-4/205 OLB Deon White. White's speed on the edge has been impressive in camp and he'll certainly have a place in the LB rotation at times this season. Craig's Granite Bay teammate Evan Tattersall has made big moves in camp, too. A tough and active player, the 6-2/225 LB appears to have a good future with the Bears and could well play this season, if needed. 6-5/245 OLB rush backer Nick Alftin Archbishop Mitty in San Jose may be bound for DE as he continues to grow. He's been active in the passing lanes and seems to be penciled in for the rotation early. OLB Joey Ogunbanjo has made a big first impression, too, challenging soph Cameron Goode on the edge rush leader front. The high energy rush backer will only get better with additional weight and experience and should play a nice role this year for the Bears. 6-4/215 linebacker Louie Bickett from Torrey Pines High School in San Diego was thought to be more of a developmental player by some as his 6'4 frame fills out but the son of NFL backer Duane Bickett showed great instincts and tenacity in the final fall scrimmage, finishing 2nd in tackles. 6-3/225 JH Tevis has seen less reps than the rest of the LB group but the dynamic LB from Menlo School will get his chance to prove himself as he continues to gain size and strength. With a deep secondary, the Bears only targeted one DB in the '18 class. 6'2/180 corner Chigozie Anusiem was an early entrant and showed well in spring ball as well as fall camp, earning a 2nd team slot in the cornerback rotation. The Bears only brought in one scholarship specialist in top-ranked longsnapper Slater Zellers from Notre Dame Prep in Scottsdale, AZ. Zellers is expected to hold down the position multiple years in the future for the Bears. Based on what we've seen in camp, an amazing 16 of 20 position players look capable of being in the rotation as early as true frosh, though many will undoubtedly be redshirted for class balance. Never in my decades of following Cal fall camp have I seen such a broad-based sign of current and likely future contributions amongst a recruiting class out of the gate. It could bode extremely well for depth and future fortunes of the team and a building block to build upon as 2nd year head coach Justin Wilcox continues to stengthen the program for a run at a bowl game this season.